You’re invited to a Hen Party! 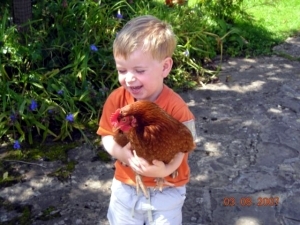 So you want to keep chickens. You’ve read the Omlet website back to front. You’ve had your local library’s entire catalogue of chicken books out on loan for months. 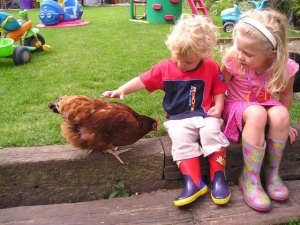 There’s just one problem – what’s it really like to have a couple of hens free ranging in your garden? The answer is simple – Omlet have launched Hen Parties – backgarden chicken keeping courses run by eglu owners using their own eglu and chickens. 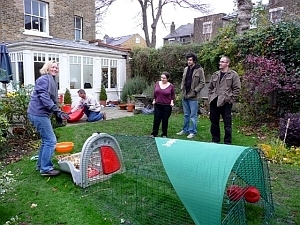 These short courses are a way for you to see an eglu in action, hold a chicken and talk to someone who was once in your shoes. In just over an hour you’ll discover the delights and day to day needs of keeping chickens and even though its called a Hen Party your husband can go to! For more information and to find your nearest course click here. And if you’re an eglu owner and fancy hosting your own party get in touch with johannes@omlet.co.uk there are no restrictions on location. We’ll be adding new courses all the time including Advanced Hen Parties (for teaching your chickens how to read and write) and courses on looking after other animals such as rabbits and guinea pigs. Anyone with an eglu is welcome to apply. If like us you’re fed up with waiting for those in the know to figure out how to save the planet then a friend of Omlets has come up with an ingenious way for you to Do it Yourself. 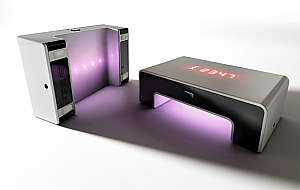 The Wattson is a beautifully thought out device that lets you see how much electricity your home is using at any given moment. With just a passing glance the soft light indicates high (red) or low (blue) usage letting you know that you may have left something on before going to bed or popping out the door. Watts on in your house? The detailed display shows current energy usage in pounds as well as watts and Wattson can also store up to 4 weeks of energy use history. This can then be downloaded to your computer and viewed using the software provided. Easier and more rewarding to install than putting up a shelf the Wattson would make an excellent Christmas present for a DIY enthusiast as well as anyone interested in reducing their energy consumption. Click here to find out more. 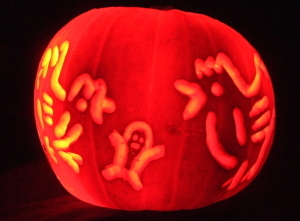 Thanks to all those who entered this years Pumpkin Carving Competition. With so many spooktackular pumpkins standing guard the ghosts and ghouls must have had a terribly disappointing time trying to put the frightners on the chickens and rabbits in their eglus. Good work gang! In fact there were so many fangtastic entries that the judges got into the spirit of the competition and decided to award everyone who entered a pack of Omlet Christmas Cards – they’re winging their way to you by first class ghost as we spook. However there had to be a winner and the pumpkin which was the sorcerer of the greatest amusement to the judges this year was by Prince of the Pumpkins Paul, congratulations you have a £20 Omlet gift voucher. make a good impression with the judges. turning her pupils into a class of pumpkins. Professor Snape as the subject for thier pumpkin. carving, witch is flying along! We had so much feedback from the last newsletter about eglu owner of the week Helen’s home made movie that we thought we would launch a brand new competition. The Omlet Oscars will celebrate, honour and award prizes for your short films. Its an open event, you can enter a serious docu-hentary, a romantic comedy or even a thriller. Try to keep them to about 1 minute long. To enter upload your video to www.youtube.com and then send a link to johannes@omlet.co.uk a To give you an idea have a look at the movie here: Please get all entries in by the 7^th of January 2008. Has someone you know been eating a lot of eggs recently or hopping from room to room whilst munching on a carrot? You may have thought this behaviour a bit odd, but there is a very simple eggsplanation. They want an eglu for Christmas! Although it’s a bit big to fit under the tree, Santa will deliver it to your garden in time and if you’re not sure which colour to give you can even get a gift voucher, which will fit under most trees. Order by Tuesday the 18th for guaranteed delivery of an eglu before Christmas, if you would like chickens delivered as well you’ll need to be quick – room on our sleighs is booking up fast. Call Santa’s little helpers on 0845 450 2056 to reserve your place. We hope you enjoy our monthly round-up of what’s new in the wonderful world of Omlet. There’s shock and horror in Barbara’s diary as she has to resort to buying eggs but she does have some tips on how to keep your garden looking good in the winter. The egluowner of the week is Lemmy from the forum and Mystic Pegg’s crystal egg has predicted a real Christmas cracker of a joke. 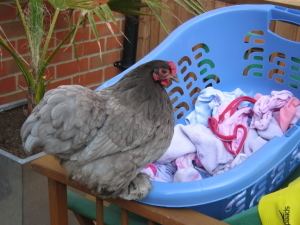 it’s only a chicken hanging out her washing. David Copperfields early attempts to make a chicken levitate failed to impress his audience. was a real rib tickler! 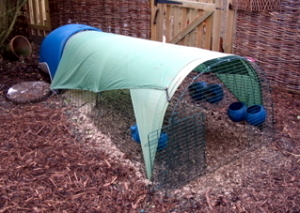 Chelsea – I have 2 eglus and 2 chooks in each eglu. Only because my hens will get very big (big breed) I’m sure you could squeeze more in if I really wanted too!! Ali-s – I’ve got 9 Bantams and 2 Eglus. All 9 Bantams go into one Eglu at night, the other is rejected. 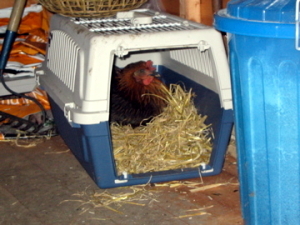 If it is a cold night I leave the chickens where they are, if it is mild I move 4 into the empty Eglu so that they don’t get too warm. 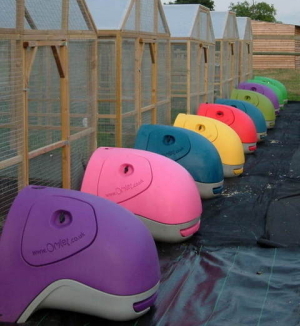 Helly Welly – Before we got the cube we had three in each eglu but we woul;d have happily fitted four in each. GooseyLucy – We’ve got three but I think I could easily fit another girl in, they seem to have lots of room at night but being a complete novice I decided to stick at 3 to start with. There again I think they all huddle together on the edge of the nest as it is filled with poo in the morning and the tray is almost clean! Christian – 2 ‘old’ girls in one eglu and 3 ‘new’ girls in another. Tonight we had 5 in one eglu. I have left them all together as they seem happy and there is still room! Bellekatz – I have 5 girls in one eglu but in a big run, not the eglu run. There is still room in the eglu at night for another one as they sleep all huddled up together. Only problem is with there being only one nesting box – during the summer I had two in squashed up together quite often!!! Egluntine – 4 in each green one. Krysia – I have gone for 4 we stasrtednwith 3 then got another eglu for the next 3 then we went down to 5 (2 are bantams) and they all stayed in 1 anyway. Now we have the cube the girls are in there and the chicks (although they arwww.christianshens.blogspot.come growing fast) are split over 2 eglu’s (6 in 1 and 7 in the other) they will be integrated soon though as they are growing rapidly. Snowy Howells – I started off with 4 in the eglu. The ‘Girls’, as they are known, arrived in the summer, a glorious day, with the sun beating down. Once Roy, the man from Omlet, had had his coffee, we set about building the run. Well I watched while Roy put the eglu and run together. Then I was handed a large wooden box making soft clucking noises. 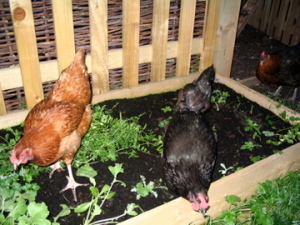 As soon as I opened the lid a ginger head poked out of the box – my first ever chickens had arrived! 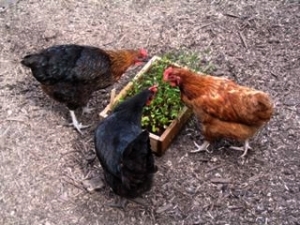 The chickens lend a hand in the garden. The first few months with the new arrivals, was a steep learning curve. Not that chickens are difficult to look after. 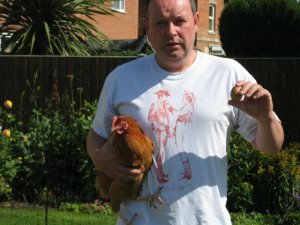 On the contrary, they are the easiest pets I have ever owned, its just that as with any animal you want to make sure you are doing everything right and with the help of the Omlet forum, I was rapidly becoming a chicken expert. The day after we got them, we were rewarded with our first egg. A momentous occasion! In no time we were getting 20 eggs a week from 3 chickens. Every time I open the egg port and see an egg it makes me smile. The feeling never changes even after all this time. Even an eglu can have a bad hair day. One thing I wasn’t expecting was the inordinate amount of droppings they produce but luckily our local Council provide discounted compost bins We are currently on bin number three! The other two are ‘brewing’ the most amazing compost my veggie garden has ever seen. In return for a clean home, water, some pellets and a few stalks of my best home grown spinach, the girls earn their keep by providing me with the best eggs I have ever tasted. 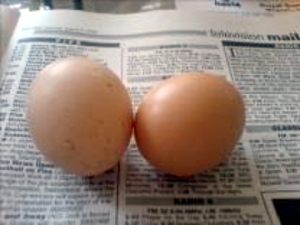 Two eggs reading a newspaper. Family, friends, neighbours and even the Post man queue at my kitchen door hoping for more eggs. That is the problem, once tasted, you never want to go back to the supermarket. More chickens are needed to keep up with demand. I have another eglu arriving soon. Ready to fill with more beautiful layers. It isn’t until you own them that you really appreciate what wonderful creatures they are. Their personalities, quirks, and habits are unique. They come running to the gate when they hear my car pull up. Sprint across the lawn when I rattle their corn tin and generally bring the garden to life. travel machine needed a bit of work. I couldn’t imagine my life without a few hens…. 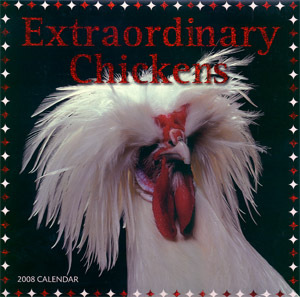 This calendar will be appreciated by everyone for it’s extraordinary photographs of some of the worlds most exotic breeds. Features many amazing birds such as the Polish Frizzle. A useful accompaniment to the Omlet Breed Directory and a cracking stocking filler. 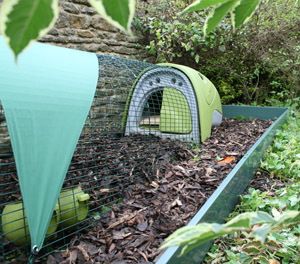 The neat and easy way to edge your eglu’s wood chipping area. This handy pack will enable you to construct an area measuring 3.5m by 2m. The15cm tall plastic boards quickly slot together and form a durable edging. Fast and easy to click together. Mystic Pegg stares deep into her crystal egg to tell you wattle happen next. Your reputation for adventure and fearless exploration to all four corners of the garden leads people to look to you to explain the laws that rule the universe. But the question that they are really asking is where are you hiding the eggs? Could it be that you are holding out for a larger share of layers pellets? Maybe your propensity for misdirection signals a career in another profession but be careful not to peck the hand that feeds you or you could find yourself looking for a new nesting box.. The librarian hands over the nearest book, the chook puts it under its wing and walks out. This happens the next day and the one after. The Librarian is fascinated and so the next time the chicken is in, he hands over a book and then follows her out. She crosses the road, walks through the woods and stops at a pond.